I went pike fishing again this week, and blanked. I missed a run within the first half an hour, but otherwise, my indicators stubbornly refused to move all day. All was not lost though, as I met two anglers, one of whom was also fishless in his pursuit of predators, and his son, an exceptionally polite and well mannered fourteen year old. After a quick chat with dad, I spent a few minutes with the younger angler, and watched as he flicked a lure up the side of some pontoons in search of perch. We discussed the merits of dropshot and jig fishing, and I was pleased to see him pick off a solitary perch, indicating that it may be an area worth further investigation, so with that in mind, I said my farewells, and resolved to return later in the week… I have only ever fished with bait at this venue but wanted to find out if perch were worth targeting on lures. 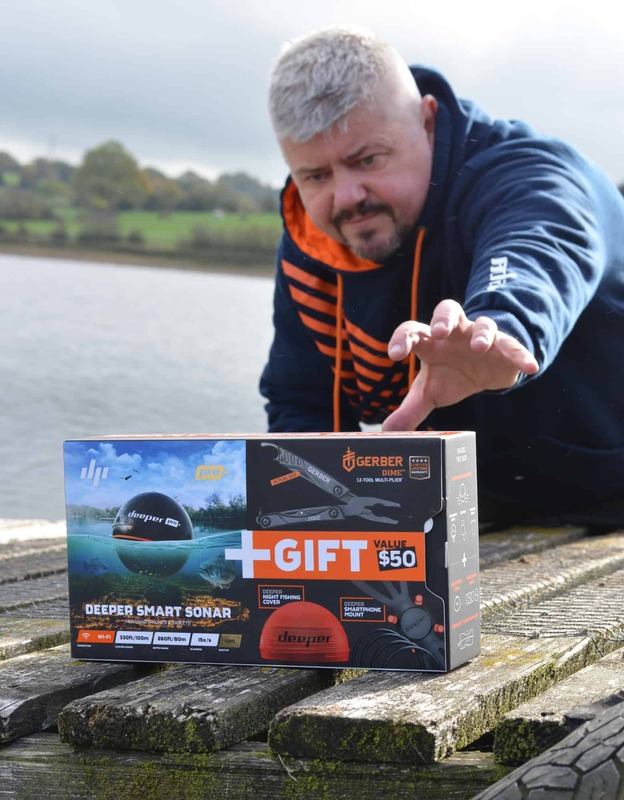 Determined to kill two birds with one stone, a few days later I was back at the water with the brand new Deeper Sonar™ Christmas package to do some product photography for one of my sponsors, and put the kit to the test. 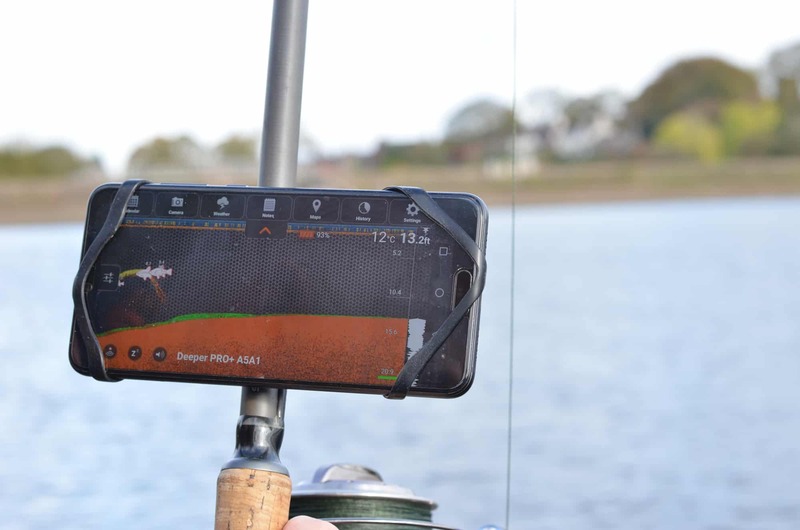 I’ve been using Deeper for a while now, and the new Deeper Pro+ is a real upgrade on the previous incarnation, with connection issues resolved, more features, and a greater casting range achievable. I tend to use it solely to confirm or locate underwater features, rarely utilising the fish finder option, but I wanted to try both for the required images. Whilst deadbaiting the water for pike, I’ve suspected an area of weed amongst a relatively clear lake bed, and this was an ideal opportunity to prove that fish were indeed holed up in cover. 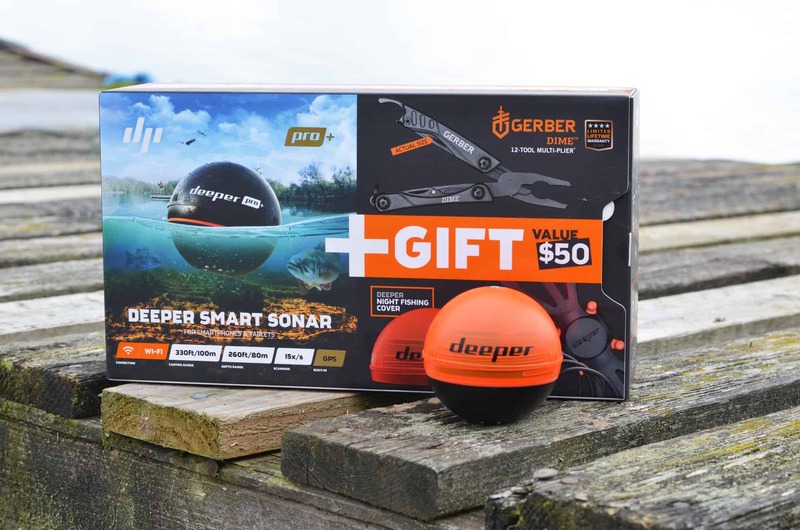 The Deeper is so easy to use; simply install the app, drop the sonar into the water (water activated battery) and wait for it to connect. At this point, I should point out that turning off mobile data gives far better connectivity, and within a few seconds, an image will appear on your phone or tablet which clearly depicts the environment below. Once stabilised, the picture will scroll across the screen, so you can pick out features, fish, temperature, depth, and plenty of other variables; it certainly makes mapping a water a far less laborious evolution than constantly casting a marker float. You can also store the information in the form of a GPS accurate map, add your own notes, and even add a photograph of the exact spot where you stand! Brilliant! Camera tripod locked in place, remote control in hand, I set about getting the requisite amount of shots for social media and marketing, including screen shots of actual use, and after an hour of repositioning, deleting, retaking, and viewing of images, was happy I’d got enough to work with; it was time to map some spots. My Deeper is attached to 50lb braid and it was quickly hurled out as far as I could cast it. I’d be lying if I said I could it to the maximum stated range of one hundred metres, (although I have used it to map river swims as it trots downstream) but then I don’t tend to fish deadbaits at that range either, so knew I’d have my spots covered. I waited for the picture to clear, and slowly wound in, pausing every few seconds to let the Deeper hover over areas of interest. I picked out a known snag with ease (pesky thing) and marked it on the GPS, then continued to retrieve over the potential weed patch. It was vegetation, but I was surprised just how far off the lake bed it rose. What I thought was perhaps a thin sheen of silkweed turned out to be substantial growth and a good depth of silt beneath. My baits had perhaps been landing in the silt which spread some distance from the focus of the weed, but at least I could confirm that the obstruction was there; noted for future sessions! I did have the fish finder turned on too and wasn’t surprised to find a good number of fish within cover. Vast areas of the reservoir were completely devoid of fish, a change in the weather had certainly stirred them up and at the base of the shelf, where I’ve caught a good number of pike, there were none! The majority were either in the weed or patrolling in mid-water near a shoal of bait fish, identified as a scatter pattern which was studded with ‘proper’ fish reflections. I spent another hour mapping the whole bank, finding depths to almost thirty feet, the remains of an old dam, another snag, and more fish, before packing away and having a quick fling with the dropshot rod under the floating pontoons. It proved to be slow going, with only a handful of perch caught, but the chill wind put paid to any further fishing, it was just too cold! I moved off to a tiny local river, determined to bank something worthy of a photograph. I’d changed the dropshot set up for a 3g jighead, loaded it with a pink Spro lure, and slid into the cramped swim beneath the trees. I’d seen a fish rise whilst approaching, so was confident of a hit on the lure. The river contains chub, trout, pike and perch, so it’s a real ‘lucky dip’ which is part of the reason I enjoy it so much. I prepared my first cast, carefully checking that my braid wasn’t looped around the end of the rod, my bale arm was open, that the backcast was clear of obstructions, and that the spot I wanted to cast to was accessible. All clear, I fired the lure out and it went straight into a tree which had a single branch hanging down! With 6lb braid and 5lb fluorocarbon, snatching it back in isn’t an option, so by the time I’d gently pulled the branch towards me, I’d made far too much noise to have any chance of a fish from the tiny swim, so scrabbled back up the bank to try the next glide. A classic small river swim, with fast water running into a widening, deep pool, it’s one of two spots here that are ‘guaranteed’. I know every nook and cranny and can tell you at any time of the year where fish are to be found, I’m that confident! The pink shad was twitched across the bottom, repeated several times, but without success. 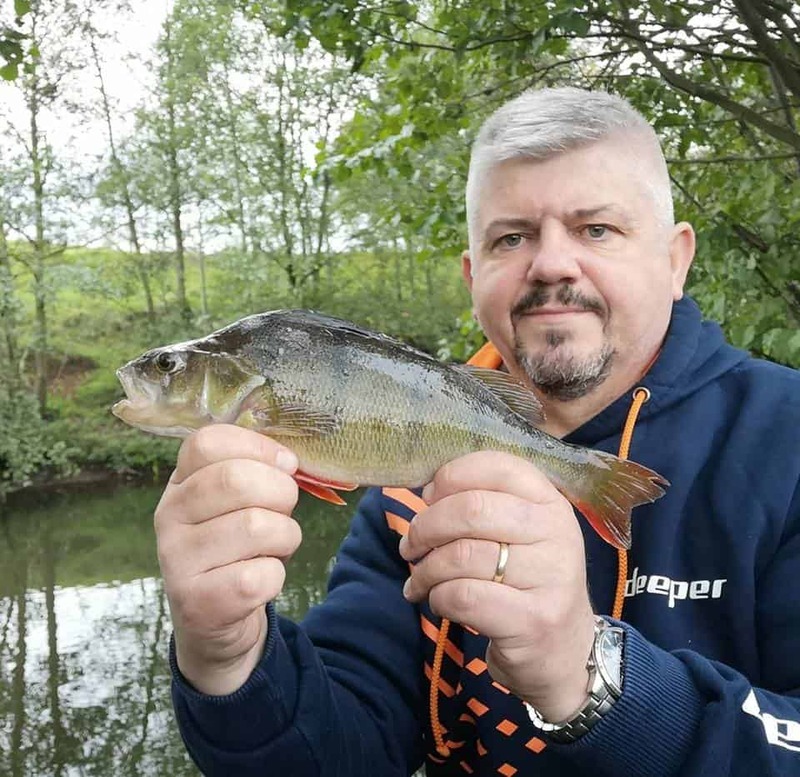 A change to a similar pattern lure in a different colour bought an instant bite, a handsome perch of around half a pound the culprit, and this continued with a number of fish banked. As I watched the rod tip, I noted a splash against the far bank, just a few yards distant, and watched a long dark shape slip by beneath the water. The clear water gave me a good view of the intruder, and I quickly realised that it was a mink, which I watched surface and swim to its home within the roots of a tree. We watched each other for a while, the mink’s pale snout clearly visible in the dark confines beneath the tree, and I have to admit that I was enthralled to see an apex predator up close. I know they are killers, but what an impressive animal, and a real treat to witness! I didn’t want to risk conflict, hooking a fish to be snatched and fought over, so moved upstream to a steady, shallow glide. I could see the river bed clearly, patched with coloured autumn leaves and flicked the lure under the roots of a tree on the near side. I watched it skip across the debris, and then it disappeared. I couldn’t spot it, and then all went solid; snagged! 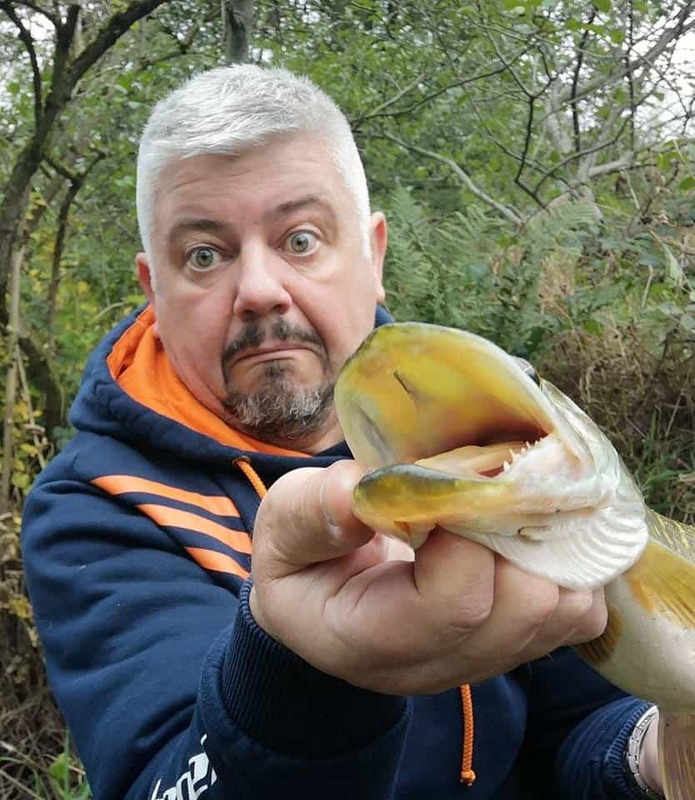 A small amount of pressure was applied to free the hook and suddenly a huge bow wave erupted as a pike leapt clear of the water in a shower of spray! I hadn’t seen it, perfectly camouflaged as it shot out and whacked the lure, and although it was only a jack of about 4lb, it gave a superb account on ultralight tackle as it sped around the confines of the river, desperately trying to dislodge the hook. Safely netted, it was quickly returned sulkily to the river, and that ended my session. An hour on the river had resulted in a number of handsome perch, a close up encounter with a mink, and a finely conditioned pike to finish; it doesn’t get better than that does it? The new Deeper Sonar Christmas package is available from 1st November (rrp £209), and contains the Deeper sonar, spare night fishing cover, smartphone mount, neoprene carry pouch, charging lead, and a bonus Gerber™ multi-tool with twelve handy functions! Check it out!